It's Official ! Obama's Select New '1st Puppy'...Bo ! WASHINGTON — Bo? It's no jest. The first family has settled on a first pet _ a 6-month-old Portuguese water dog that the Obama girls are naming Bo. The selection was one of the White House's most tightly kept secrets. President Barack Obama's daughters, 10-year-old Malia and 7-year-old Sasha, picked a black and white pup, a White House official speaking on the condition of anonymity told The Associated Press Saturday night. The dog is a gift from Sen. Edward M. Kennedy, D-Mass., who owns several Portuguese water dogs himself. "We couldn't be happier to see the joy that Bo is bringing to Malia and Sasha," Kennedy said in a statement. 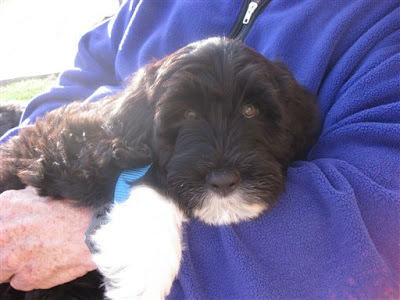 "We love our Portuguese water dogs and know that the girls _ and their parents _ will love theirs, too." The Washington Post reported in its online editions Saturday night that Obama's daughters chose the name Bo for the pup because first lady Michelle Obama's father was nicknamed Diddley. The name for the dog was an apparent reference to the singer "Bo" Diddley. White House aides told the AP that the office of the first lady arranged an exclusive deal on the dog story with the Post. The officials, who demanded anonymity because of the deal with the Post on exclusive details, said the dog was not in the White House as of Saturday evening. Throughout the day Saturday, celebrity Web sites and bloggers were abuzz with rumors of the first family's selection of a Portuguese water dog; one site even claimed it had pictures of the future first pet. The president had embraced the frenzy: "Oh, man, now, that's top secret," Obama joked Friday to reporters. Obama promised his daughters a puppy during the campaign. "This is Washington. That was a campaign promise," Obama said when he appeared on Jay Leno's talk show last month, as the audience roared with laughter. "No, I'm teasing. The dog will be there shortly." The president and first lady had said their choice was down to either a Portuguese water dog or a Labradoodle because they were considered good pets for children who have allergies, as Malia does.